Cal Poly professors Jodi Christiansen and Stephanie Wissel were on the edge of their seats Thursday when the National Science Foundation announced a revolution in astrophysics. For the first time, scientists have located the source of a high-energy neutrino from another galaxy. This discovery gives them a new way to learn about the universe. Christiansen studies gamma rays and Wissel studies the subatomic particles called neutrinos, both central to the new understanding of how the universe works. For more than a century, the origin of the highest energy particles in the universe, called cosmic rays, has been a mystery. The sign of particles being accelerated to become cosmic rays is the emission of neutrinos and gamma-rays, but no one had observed the two together to pinpoint the source of that acceleration. In September 2017, the IceCube detector in Antarctica recorded a high-energy neutrino, a somewhat rare event. Telescopes around the world and in space then turned to observe the area the neutrino might have come from. They found a blazar, a supermassive black hole with powerful outflowing jets. These jets accelerate cosmic rays to extremely high energy, and the cosmic rays then emit gamma rays and neutrinos through a variety of physical processes. Though scientists have observed blazars for many years, they didn’t know whether the jets sped cosmic rays up to the highest energies. The combined data from IceCube and the telescopes shows that they do. As part of the VERITAS (Very Energetic Radiation Imaging Telescope Array System ) team, Christiansen is one of the thousands of scientists who contributed to these groundbreaking observations. She was also part of the team that designed IceCube. 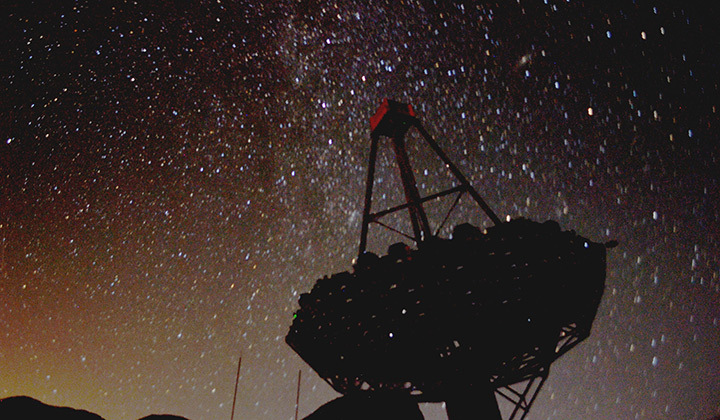 Nearly every summer, Cal Poly students travel to Arizona to observe blazars using VERITAS or work on the telescopes. Others do data analysis back on campus. Wissel and her students are designing a new kind of neutrino detector, and she sees this discovery making a strong impact on her field of study. The results were published in an article in the journal Science. Several supporting papers further explain the discovery.